The message below was sent on 7/9 to all instructors and teaching assistants who have used Quiz. If you did not receive this message and would like to receive future communication regarding the retirement of Quiz, you can join the Quiz users mailing list. This is an announcement-only list; you will only receive messages from EEE staff, and we will use it sparingly. At the end of Fall 2018, it will no longer be possible to create or assign new EEE Legacy quizzes. Instructors and TAs will be able to access quiz content and results through the end of Winter 2020. In order to prepare, instructors and TAs should retrieve copies of past quiz content and results, then administer future quizzes in Canvas. 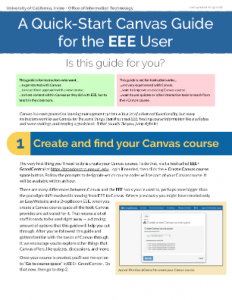 For help with Canvas, email eee-support@uci.edu or call the OIT Help Desk at (949) 824-2222. To reiterate: Fall 2018 will be the last term in which it will be possible to create and assign new content through EEE Legacy Quiz. You should now begin to save copies of past quiz contents or results that you may need later. The message below was sent on 7/9 to all instructors and teaching assistants who have used EasyWebsite. If you did not receive this message and would like to receive future communication regarding the retirement of EasyWebsite, you can join the EasyWebsite users mailing list. This is an renouncement-only list; you will only receive messages from EEE staff, and we will use it sparingly. At the end of Fall 2018, it will no longer be possible to create new EasyWebsites, nor will students or the general public be able to access any EasyWebsites. Instructors and TAs will be able to access their content via the EasyWebsites tool through the end of Winter 2020, when EasyWebsites will become totally inaccessible. In order to prepare, instructors and TAs should download copies of their content, then transition to next-generation systems (e.g., Canvas or UCI Sites). To reiterate: Fall 2018 will be the last term in which it will be possible to create new EasyWebsites. You should download any content or files that you may need later and prepare to transition to Canvas or Sites@UCI. This new guide is designed to help instructors who are accustomed to EEE get up and running in Canvas with files, the course syllabus, and a gradebook.